A large field of enthusiastic IPGC members gathered at St Andrew’s for the November IPGC Members’ Tournament on Wednesday, 3rd November. The testing course was well presented but the greens disappointed because they still bore evidence of recent sanding and were needing a cut, but the dry conditions gave much more run on the fairways. A fresh cooling breeze gave the golfers a comfortable round after the humidity of late. 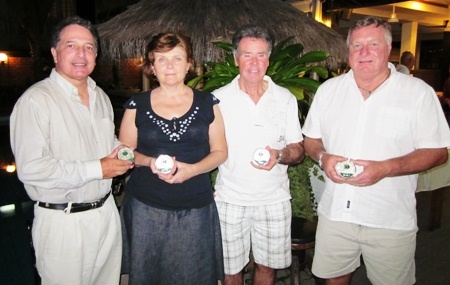 Monthly winners (Left-right): Steve Mascari (Div 1), Valentina Hiller (Ladies), Frank Hughes (Div 2) and Don Everett (Div 3). Each monthly members’ tournament provides three winners in the gentlemen’s divisions and one from the ladies, who will go forward to the finals to compete for the Gold and Silver Medals later in the season. In addition the tournaments will also be used to determine the IPGC Gentleman Player of the Year, with between 1 and 15 points to be won in each division every month, dependant on final positions, which will then be aggregated for the year to establish the overall winner. As usual the first division contested a stroke play format whilst the second, third and Ladies’ division played stableford. In the first division the contest was inevitably a very tight affair with Robert Lamond playing to form, recording net 72 for third place. Ahead of him it took a count-back to decide the top two places as Phil Mitchell’s net 71 matched the net score of perpetual favourite Steve Mascari but he was relegated to runner-up as Steve’s splendid back nine of only 34 shots stole the day. The second division saw Charlie Shepherd’s 38 stableford points finish third, just one behind Joe McArdle’s fine 39 points. The flight winner was Frank Hughes and he took immense satisfaction in the knowledge that 40 points on a course such as St Andrew’s was a remarkable feat. The third division was an even tighter affair with three golfers tying on 37 points. Allen Dow’s stuttering finish relegated him to third having been in pole position for much of his round and it took a back-six calculation to place Rod Howett in third place with the better finish coming from Don Everett and his back-six of thirteen points. The Ladies’ winner was Valentina Hiller. After the tournament there was a welcome return to the Haven after a break of a few months for the presentation buffet, generously sponsored as always by the IPGC, and IPGC Chairman Chris Knapp warmly thanked all those who had worked hard once again to ensure the success of the competition, especially registrar Glyn Evans from Jomtien, Starter Chris Knapp, results coordinator Stephen Beard and the event organiser Russell Exley. Next month’s event will be certainly be eagerly anticipated by the IPGC members after such a successful day at St Andrew’s.